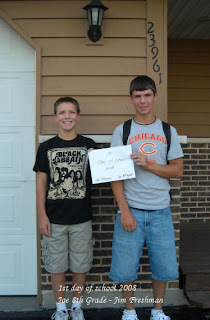 Today begins a new chapter in the boys lives...Jim is off to High School, Joe is off to 8th grade. Every year since the boys started school, I've had them stand in front of the house in the same spot - it's fun to see how they've changed each year (not to mention how tall they've gotten). Even though they won't admit it, I think they are happy to be back in school! Give your kids an extra hug today - they grow up way too fast! 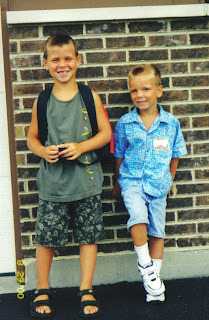 Here's a look back at 2000, Jim in 1st grade, Joe in Kindergarten....Boy have they grown! What a sweet thing to do and they look like fine young men. Wow Lisa! That is so cool that you have first day of school pictures from every year. You can actually see how much they've grown. Very sweet Lisa. The boys look great, that brick background is great for judging how tall they've gotten! !